Hello and welcome fellow Vault 111 survivors. In order to traverse this excitingly splendid world of nuclear wasteland, you may be interested in what it’s going to take to power your journey. These builds are based on the Fallout 4 PC requirements you see below and on the most recent benchmarks for the game as shown in the supplied chart below. This will help you choose the hardware you need to both play the game and to play on the highest settings. The good news on the system requirements front is that it looks like Bethesda has given the game a wide spread in terms of hardware from the minimum to recommended requirements, so most PC’s with a decent card should be able to play the game, but here we’re aiming for maxing it out. 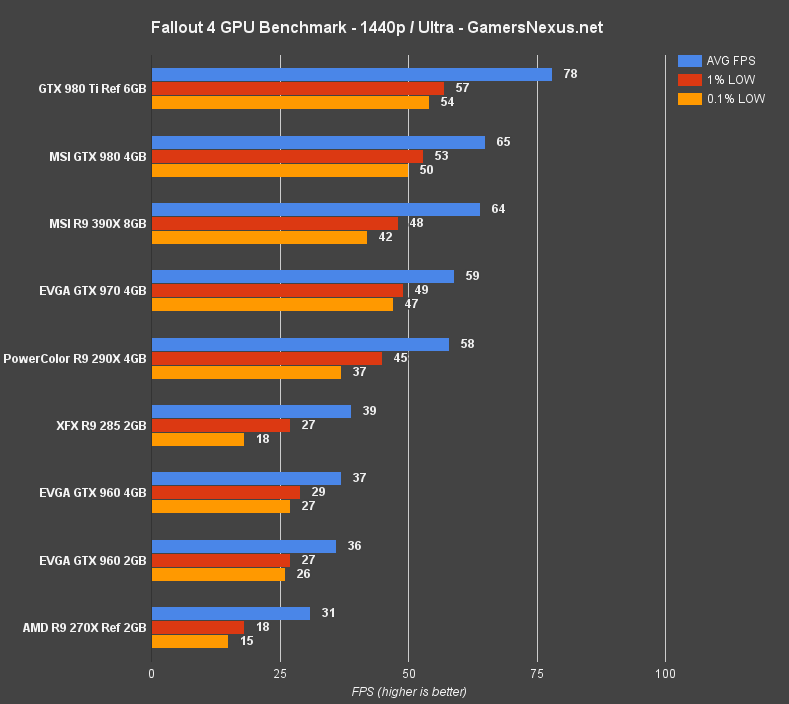 The following builds are based on the benchmarks done by gamersnexus.net and below you can see Fallout 4 benchmarked on various graphics cards. The builds below are based on a 60 frames per second performance threshold, so please if you want to still play the game on max, I would still consider any graphics card that performs with 40fps+ a good performing system. If you want to learn more about Fallout 4 you can do so at fallout4.com and if you haven’t already done so, you can purchase Fallout 4 here. Sure you will be able to play Fallout 4 with lower hardware specifications, especially when compared to the requirements set out for the game, but if you are going to be building a brand new gaming pc, you might as well make it an up to date build worth building and capable of giving you a great bang for your buck gaming experience. This build will play fallout 4 maxed out with 60 frames per second at 1920×1080. This build is a fantastic choice for those who want to play Fallout 4 smooth as butter at 1920×080 on max and includes the newest of the Intel line of Skylake processors and the more then capable GTX 970 graphics card – which will actually get you nearing 80fps according the the chart in the introduction to this article. The next nearest card is the R9 285, which is still a viable card for this game, but when benchmarked it doesn’t quite hit 60fps, which is playable but not the goal of this article. The included processors is the Intel i5 6500, a new skylake processor. 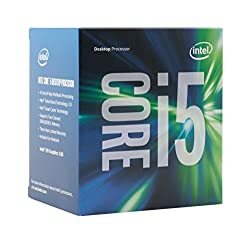 This is the more affordable version of the i5 6600k I’ve included in the recent monthly gaming pc build articles, although it is not unlocked like the 6600K, so overclocking won’t be as simple – this should be fine for non enthusiasts though. 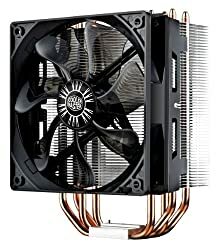 I’ve included a Cooler Master Hyper 212 CPU cooler since there is simply no stock cooler included with the cpu, this cooler will be more then enough. 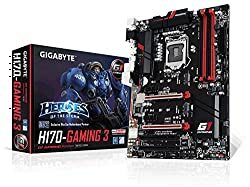 The included motherboard is the Gigabyte H170 Gaming 3 board, perfect enough for this build and fits perfectly with the Intel i5 6500 cpu, since there is no need for overclocking, which makes the cost of this board even better. The included Sapphire R9 380 should pump out enough juice to play Fallout 4 on high settings at 1080p, which fulfills a higher requirement then the minimum specifications for the game, although lower then its recommended. For both the minimum and recommended requirement the game specifies 8GB of ram. Well, included in this build is 8GB (two 4GB sticks), although I will do you one better with 8GB of DDR4 RAM. 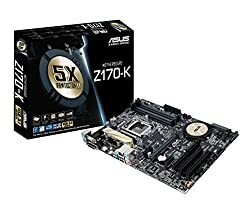 This is not only compatible with the current motherboard, but an upgrade to most builds using the latter and previous DDR3 RAM. 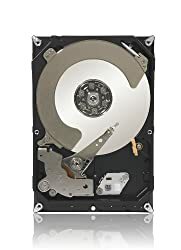 For a hard drive we have a 1TB Seagate HDD, more then enough space for Fallout and 0plenty more for storage, although this is no SSD, which may cost you more. The power supply is an EVGA g1 650 watt, which is a reputable PSU with more juice then you need. 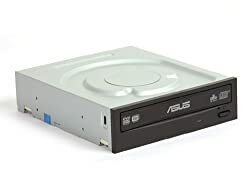 And finally, I have included an Asus optical drive for those that need to install software via CD / DVD or write to, but these days I would recommend moving on and installing your OS / software via USB or otherwise; it just takes less space in your case. This is the build to build if you are a serious Fallout 4’er, is that a thing? In all honesty though, this build may be a tad overboard for most and in fact may be a tad overboard for Fallout 4. This build does appease to the recommended requirements specified by Bethesda for Fallout 4 and more then enough fo the above included benchmarks, but it will play max settings 2560×1440 resolutions with far more then 60 frames per second. So…if you are looking to play Fallout 4 and most of any game maxed out, this is the build for you. The Included processor is a new Skylake Intel i5 6600K, fully capable of overclocking and a very capable processor for gaming. 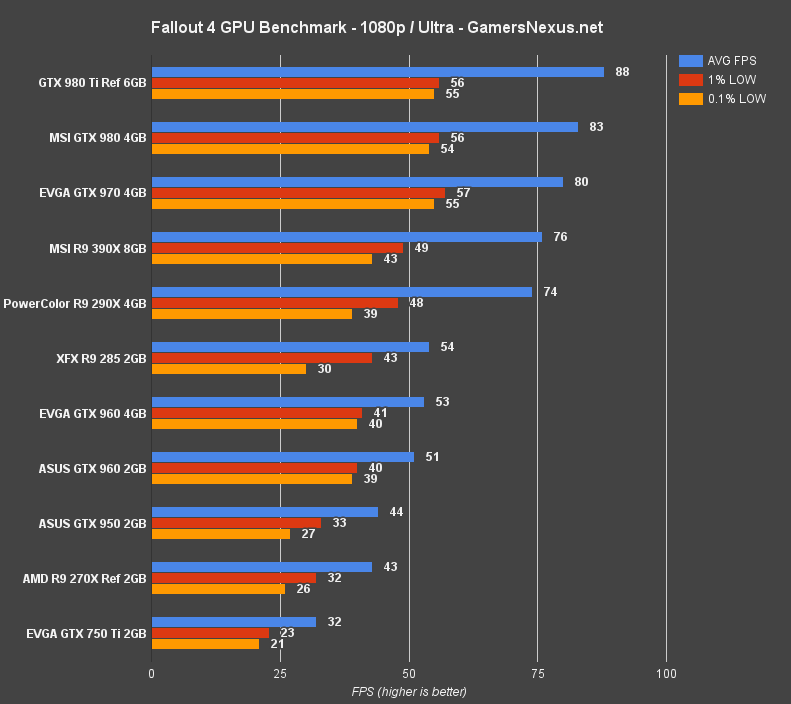 Fallout 4 will take advantage of an i7 processor more then most games, but there is no need should you just want to max the game out at 2560×1440 at 60fps – perhaps more for those that are interested in 4k gaming. Like the last build, included is the Cooler Master Hyper 212 EVO cpu cooler. This is included not only because the 6700k processor has no included cooler, but because this is one of the best most affordable coolers capable of even overclocking the best processors. The included graphics card is the ASUS Strix R9 390X graphics card. 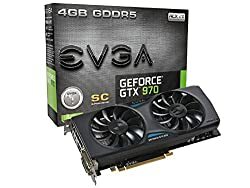 This card fully supports the recommended requirements for Fallout 4 and is more then capable of gaming with the best of the best of modern games. 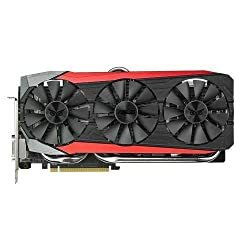 This card should play the game maxed out at 2560×1440 resolutions with 60+fps. Realisticlly though, you can almost get this performance using the first builds GTX 970, so please keep that in mind when deciding on which build to purchase, as this could save you some cash. For both the minimum and recommended requirements for Fallout 4, there is a requirement for 8GB RAM. Included in this build is 8Gb (two 4GB sticks) of Cucial Ballistix Sport DDR4 Ram. That’s right, DDR4 RAM, the newest generation of RAM, which is another reason to recommend the most modern of builds for a game like Fallout 4. The included hard drive is a Seagate aTB HDD, yes plenty enough room for Fallout and plenty more, but I do recommend a Solid State Drive more premium loading and writing speeds. This drive is a great drive although it will cost a tad more for an SSD, but it’s not pertinent. 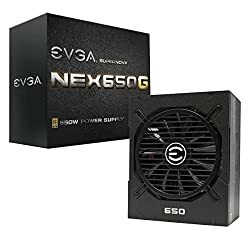 For a power supply we have a EVGA Supernova G1 650 Watt PSU, this has the perfect amount of juice for this build, that is unless you plan on adding two of these in the future. No matter though, for this build its enough juice and will work perfectly for any Fallout 4 build. The PC case was chosen as a reputable case, the Antec Three Hundred Two Gaming case and to try and keep costs minimal if your goal is to maximize performance per dollar spent on the overall hardware. Lastly, I have included an Asus optical drive. This drive is not included in the base cost for the build, but some may want it. You can either install your operating system via a USB stick or install is via DVD. Honestly though, I have no use for one of these anymore and no longer feel the need to recommend one, so up to you! Hello, I checked the parts listed on pcpartpicker, and apparently the motherboard has usb 3.0 ports but the case doesn’t have the front slots for them. I’m new to building a computer and this is my first, so maybe it doesn’t matter and I’m just unaware. Thanks for the help! Which build specifically are you referring to? Both of the motherboards listed above do have USB 2 headers as well as 3, so you would just connect the USB 2 to the case. You would then also have USB 3 functionality using the back of the motherboard / with access at the backs of the cases. If you would like the case to use the USB 3 headers so that the case also has USB 3.0(giving you more USB 3.0 ports), then yes you will need a case that supports that. The cases above were selected to save as much as possible on the builds, so there are tons of other options, if you want a few suggestions let me know. Otherwise, the builds are still good. Thanks Corey, my only concern was that I wouldn’t have easy access to the USB ports. As a side note, will I need to do anything extra in oder to have a usable headphone jack, or do they come installed into the motherboard or cpu? I’m not an expert as you can see. Hey that’s a fair concern, and you would have access just as USB 2.0 on the front of the case. If you went with the Antec Three Hundred Two case above, it does support usb 3 on the front though (the case in the other build). And in both of the cases in the builds above, they have front panel Audio in and out, which can be used for mic, speakers, headphones etc. While you can also use the USB ports (usb2 or usb3) for headphones using a usb connection. The case will have connectors that you connect directly into the motherboard to support this. 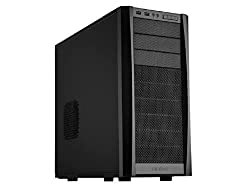 So what would be the build for a micro tower….I am building my first pc , that to be honest I am trying to make a mobile studio/ gaming platform any suggestions ? Uses Similar hardware to the first build here (maxes out fallout 4 no problem) and uses a Corsair Carbide 240. To be honest the case is a tad larger then I would have liked, but it looks fantastic. An alternative Micro ATX case I would suggest if you are looking for portability could be the BitFenix Prodigy case – it has handles which would make it more portable. Another unique Micro ATX is the Corsair Graphite 380T case, which is also quite portable. 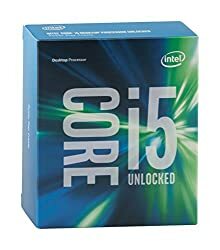 Hello, I want to use this build for my first computer , but have gotten mixed reviews on the graphics card should I get the one mentioned or what would be a good alternative ??? You’re referring to the Gigabyte R9 390 right? You could get any R9 390 really, so I would go with what’s the most affordable to be honest, which looks to still be that Gigabyte card. I’m personally using that exact card right now and I guarantee all the reviews are referring to the “startup” problem, which I have experience. Basically how it works is if you shut your pc down, it starts back up, unless you manually switch it off – it’s an easy fix though as all you have to do is turn of quick start (in my case in Windows 10). So personally I see no major problem with the card as I haven’t experience the problem since purchasing and turning that one setting off. Likewise you could currently go with XFX Radeon R9 390 8GB Double Dissipation which is about $17 more. Hope this helps in your decision and let me know if you have any further questions. Thanks for taking the time to respond I’m check out the XFX Radeon R9 390 8GB Double Dissipation recommend a good power supply and fan cooler. Also i take it this card will play Witcher 3 and other Triple A games a pretty high levels. You bet, it’s a great card. Best of luck! So I was wondering how you might suggest upgrading a previous build if yours to run Fallout 4 smoothly. 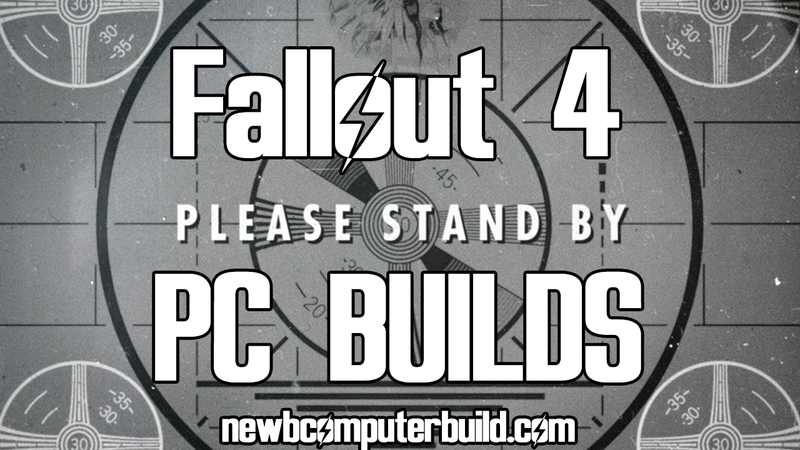 I’m still using this build exactly https://newbcomputerbuild.com/newb-computer-build-home/june-2014-gaming-pc-builds-month/#600-pc-build and want to upgrade it enough to run fallout 4 well. What would you suggest budget wise? Man, I wish I had the spare 600 needed to build this computer. Not so much for fallout 4, but the next elder scrolls game that will use many of the features fallout 4 has. Most likely will be similar specs. What’s your setup like right now? a cheapo refurbished computer that can basically only run minesweeper. 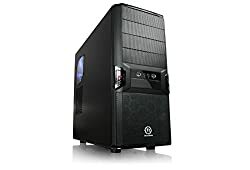 Currently saving up to build one of the computers listed on this site. Probably the October 2015 $600 computer. Awesome, well minesweeper is a classic, so not all is lost. The price didn’t update, it’s now the proper cost 😛 Which is obviously more expensive.